Ahhhh, summertime. The lazy days of outdoor sports, camping, hiking, swimming pools, vacations, and picnics are well underway. But what inevitably comes with these activities? That’s right, insects. If you’re anything like me, you spend half your summer on fun activities outdoors, and the other half thinking about how to keep mosquitoes away. Insect repellent is my friend. Especially now that the list of insect-borne diseases seems to be increasing: Lyme, Zika, and West Nile, oh my! Deet is in the deets. Many folks think that the more deet (N-diethyl-meta-toluamide) in the repellent, the better it is. But that’s not necessarily the case. CR recommends products with 15 to 30 percent deet, which provide long-lasting protection. In fact, higher concentrations of deet could lead to health risks. Beware “au naturale.” Many makers of “natural” insect repellents claim their products can ward off mosquitoes; however, CR reported the only natural repellents that worked in their tests contained oil of lemon, eucalyptus, or picaridin (effective at 20% but can irritate your skin and eyes). Can the combo. Don’t use combination sunscreen-insect repellents, because one must reapply sunscreen every couple of hours, which could cause over-exposure to the chemicals in the bug repellent. Baby your baby. Important: don’t let children apply repellent themselves. Spray it in your hands and rub it on them, preventing your little ones from accidentally spraying it in their eyes and mouths. And check age warnings for children under two – some products may be harmful. Now, our bodies aren’t the only things that attract insects: if you enjoy any kind of beverage outdoors, watch out! 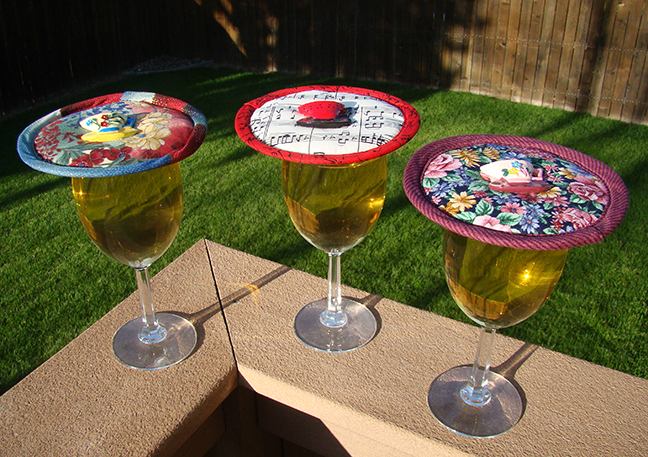 Those creepy crawlies are looking to score a perfect 10 on their high dive into your cup or wine glass. Critter waits on deck rail, plotting to high dive into your drink if it doesn't have a cover. Protect your insides by using some sort of cup cover. A napkin or lid might do, but I’ve found my Thinsulate-insulated Kup Kap cup cover will keep insects away (while keeping your drink hot or cold!). Some of my favorite Koffee Kompanions’ “outdoors-y” patterns to go with my summer fun include coffee beans, Asian flowers, music, and garden floral designs. Have any other tips to keep insects away? Leave them in the comments below!